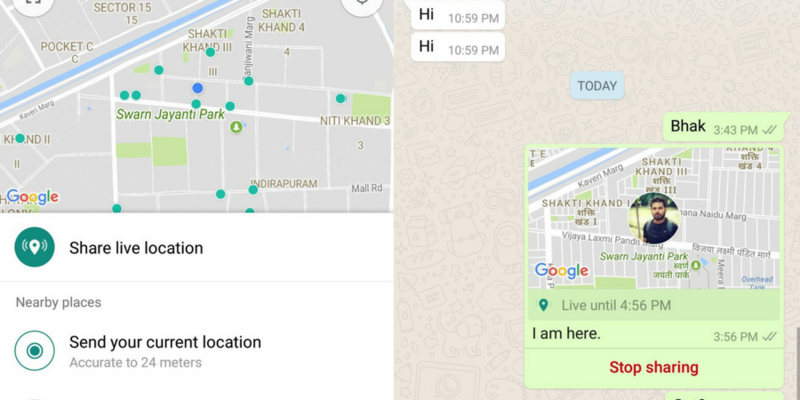 WhatsApp recently rolled out live location sharing on its messaging app. It allows users share their location in real-time with a friend or group. Location sharing was the part of WhatsApp for a long time, but the recent live location sharing is also interesting. The option to share your real-time location is on the same window that you use to send your location. Follow these steps to share your live location on WhatsApp. For this article, I am showing the steps for Android device, but these are similar on iPhone as well. Step 1: Open WhatsApp and select the conversation where you want to share your live location. You can either use an individual conversation or group conversation depending on the need. Step 2: Now tap on attachment icon (Pin) and select the location. Step 3: In next window, you will see the option “Share live location”. Tap on this. Step 4: Now you can select the time duration and comment before you tap on send button to share live location. Step 5: Then it will share your live location on WhatsApp conversation. After you have sent your live location, your friends can track you in real-time. This live location sharing will be live for the time you have selected it to be. If you want to stop it manually, you can always do that by tapping on stop sharing icon just below the location message in the chat window. This live location sharing option helps a lot. You can assist your friends or take help from them when you plan to meet a random place. Try this feature when you need it. The same kind of option is also available on Google Maps. But I think people will prefer WhatsApp. What do you guys think about this new feature? Let us know in comments.